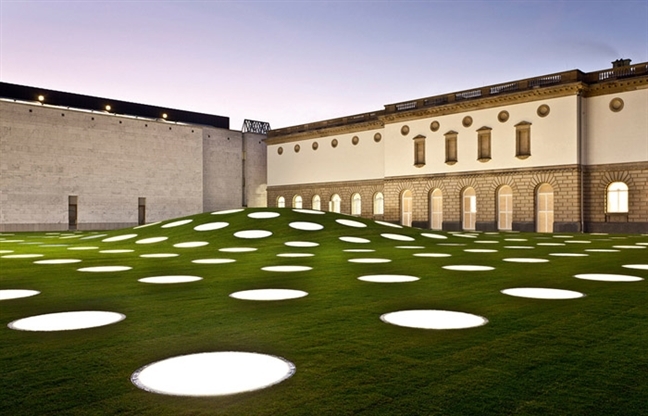 (form the architect ) The new extension to Frankfurt’s beloved Städel Museum, designed by schneider+schumacher and completed in February 2012, incorporates landscape, light, art, and subtle architecture. 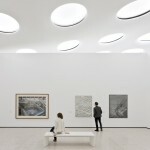 The project is the result of an international competition to design the extension of the Städel Museum in Frankfurt, Germany that would extend exhibition space from 4,000 m2 to 7,000 m2. 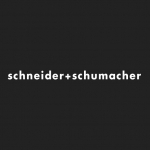 Among a select group of international architects, including Diller Scofidio + Renfro, Gigon/Guyer, Jabornegg & Pálffy, Kuehn Malvezzi, Sanaa, UNStudio, and Wandel Hoefer Lorch + Hirsch Müller, schneider+schumacher was declared the winner in Spring 2008.
schneider+schumacher’s winning design nearly doubled the exhibition area without compromising the openness of the museum— by burying the 27.568 m³ building beneath the museum’s garden. The new building adjoins the garden wing completed at the start of the 20th century and itself the first extension of the original museum building, which was built on Frankfurt’s Schaumainkai in 1878. 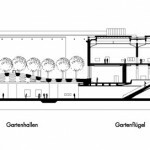 In contrast to any of the extension work carried out to date, the new section of the museum will not be above ground; the generous new space planned by schneider+schumacher will be located beneath the Städel garden. 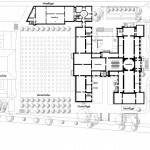 The new exhibition space will be accessed via a central axis from the main entrance on the museum’s river side. 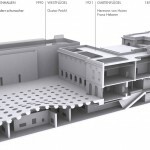 By opening the two tympanums to the right and left of the museum’s main entrance foyer, visitors will be able to reach the Metzler Foyer level.A staircase will then lead from this area down into the 3,000-square-meter museum extension beneath the garden. 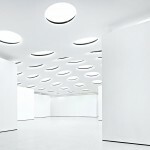 The garden halls’ interior then will be characterized by the elegantly curved, seemingly weightless ceiling, spanning the entire exhibition space. 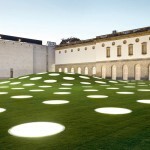 195 circular skylights varying between 1.5 and 2.5 meters in circumference will flood the space below with natural light as well as form a captivating pattern in the garden area above. 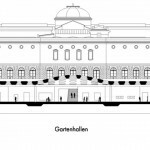 Outside, the green, dome-like protrusions, which visitors willbe able to walk across, will lend the Städel garden a unique look and create a new architectural hallmark for the museum. 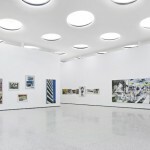 “Frankfurt will not only gain a new, unique exhibition building,” declared the competition jury, “but as a ‘green building’ it will also be very much abreast of its times.” The generously spacious, light-flooded garden halls will be the new home of the contemporary art section of the museum’s collection. Designed by Oskar Sommer in 1878, the interior of the museum’s original historical building, the Main River wing, on Schaumainkai is organized around a central axis. A second construction phase to add the two garden wings in 1921 served to extend this axis in keeping with Sommer’s original concept. 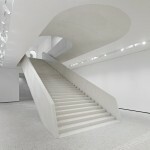 In light of this longreaching history it seems only natural to maintain this established principle and extend the trajectory along the central axis via the Metzler Foyer and into the new exhibition space.The extension will ascribe the entrance hall in the original building and its central staircase a particular significance. 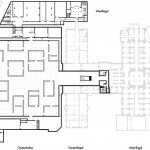 By opening the two tympanums to the right and left of the museum’s main entrance foyer, visitors will be able to reach the Metzler Foyer level in the garden wing. 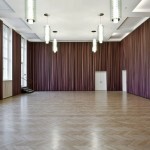 Together with the adjacent Metzler Hall, currently holding Thomas Demand’s new installation, the Metzler Foyer will also function as an event venue as well as providing additional exhibition space. 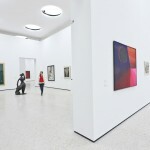 The Städel Museum’s existing rooms are marked by their abundance of natural light. 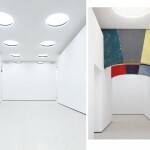 The new space will be fitted with 195 circular skylights varying between 1.5 and 2.5 meters in their circumference, lending the space a similar bright, airy feel to the “old” rooms. The openings will also include a shading system to avert direct sunlight, while a blackout feature affords the possibility of blocking out daylight completely. 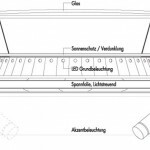 The ambient lighting will be integrated into the skylights and individual outlets will guarantee a great deal of flexibility to illuminate individual exhibits. These swellings in the land, bewildering and natural at the same time, will function to enhance the Städel Museum’s architectural identity. 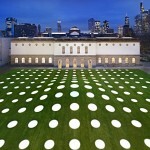 This green dome alone will constitute a significant enrichment to the architecture of the original Städel Museum complex. 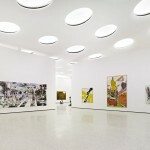 The architects have succeeded in subtly offsetting the current separation of the building and the garden area and by extending the space’s trajectory out into the garden; they have also created something of an extension of the museum’s foyer. 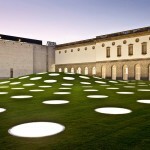 A path leading through the grounds reveals ideal resting spots, sculptures, areas of retreat and spaces to hold events. 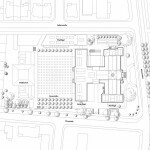 The new design of the garden area could also prove beneficial to the architectonic relationship between the Städel Museum and the Städel Art Academy. 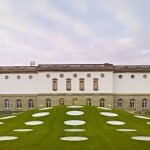 The Städel Art Academy, which was modernized in the course of the construction project by schneider+schumacher, provides a perfect counterpart to the south-facing façade of the garden wing. In its new form, the garden will span from the building where the art is housed to the courtyard of the building where new art is created. Themuseum, the Art Academy, the library, the events hall and the garden will form a locus for cultural interaction – conceived as an expression of the progressive mentality of its benefactors. An underground energy storage unit based on heat exchangers (geothermic drilling down to 90 meters) and downstream heat pumps will be used to heat and cool the museum’s rooms as necessary. This energy storage unit will help balance out seasonal variations in the museum’s energy requirements, while the heat pump will subsequently allow the museum to cover its heating and a portion of its cooling requirements using renewable energy sources. 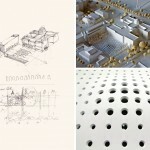 The planned ventilation system will not only cool the newly-built exhibition halls but humidify and de-humidify them too. It is also equipped with a highly efficient heat recovery facility, while diffuser outlets in the walls will aerate the space. 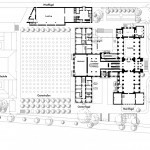 The technical components will be housed in a control room adjacent to the exhibition halls. 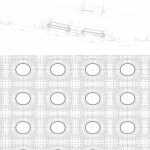 The compact underground construction, the energy storage unit for heating and cooling the space and the large internal storage capacity will create the optimum internal climate for such a building while using as little energy as possible.